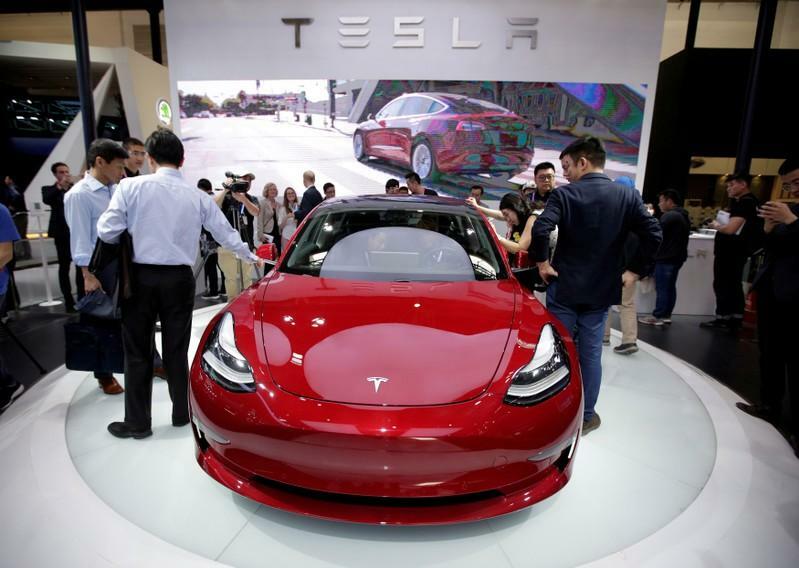 SAN FRANCISCO/BANGALORE (Reuters) - Tesla Inc delivered a third less vehicles in its first quarter as the electric car maker struggled with its first shipments of the Model 3 sedan to Europe and China due to longer transit times. Tesla said it had only delivered half of the quarter's numbers by March 21, with 10,600 vehicles still in transit at the end of the quarter. By comparison, only 1,900 vehicles were in transit at the end of the fourth quarter. Tesla, whose delivery numbers missed analysts' expectations, had been expected to post lower deliveries, and it warned in February that it would post a first-quarter loss. On Wednesday, Tesla said net income in the quarter would be negatively impacted by the lower delivery and recent price cuts. Tesla delivered 50,900 Model 3s in the quarter, falling short of analysts' estimates of 58,900, according to IBES data from Refinitiv. Deliveries of all models fell 31 percent from the fourth quarter to 63,000 vehicles, including 12,100 Model S sedans and Model X SUVs. Total production fell 10.92 percent to 77,100 vehicles from 86,555 vehicles in fourth quarter. The company churned out 62,950 Model 3s, up from a total of 61,394 Model 3s in the fourth quarter. The Model 3 is the linchpin of Tesla's growth strategy and Chief Executive Officer Elon Musk is under pressure to deliver the vehicle to new international markets efficiently, while guarding working capital. Musk has been engaged in a public battle with U.S. regulators stemming from his tweets about Tesla's production estimates. Tesla focused primarily on delivering the new sedan to buyers in Europe and China in the first quarter. In late February, Tesla said it would soon begin selling its originally promised $35,000 version of its Model 3 sedan to its North American customers but it was too late to make a marked difference in its quarterly deliveries. Before Tesla announced its $35,000 version, analysts had expected to see a drop in the number of Model 3s delivered to U.S. customers as demand for the higher-priced versions waned and tax subsidies were halved. Delivering its Model 3 to international markets posed new challenges for Tesla. Musk tweeted that the company encountered "many unexpected challenges" when Model 3s came through the Belgian port of Zeebrugge in early February. More recently, misprinted labels delayed Model 3s entering through Shanghai. On the other hand, the arrival of the Model 3 in Norway led to a surge in market share for Tesla in that country. The Model 3 was the biggest seller in Norway in March. Tesla had warned in January that Model 3 deliveries would be about 10,000 units lower than production in the first quarter due to transit times. In March, Tesla resumed building cars for the North American market, leaving only a short window for those vehicles to be delivered to buyers across the United States and Canada. Musk told all Tesla employees to prioritize helping with end-of-quarter deliveries. The company has laid off some workers, including about half of the team hired to deliver cars in the United States, and said it would close stores to lower costs. It has since said it would keep higher-volume stores open, while announcing a 3 percent price increase on some models.